If you haven’t heard or tried this tasty and healthy delicacy, you should do this without any delay! It’s an easy to cook, homemade dessert to satisfy your sweet tooth. And to top it all, this dish is rich in fibers. Take a non-stick frying pan and pour the ghee and let it heat. Once heated, add the grated apple and cook on a medium flame for 10 minutes. Stir continuously so as not to burn the apples. Now add the grated mava in the pan. Stir and cook for 5 minutes till mava blends with the apples. Next step is to pour the milk in this mixture and let it simmer for a 5 minutes. Don’t forget to stir a couple of times while the milk is simmering. This will prevent forming lumps. Add the sugar and walnuts and cook for another 5-6 minutes. Make sure you are cooking on a medium flame throughout. Cook till the milk soaks up and mixture becomes moist. Let it cool. Add 2 drops of vanilla essence. Garnish with chopped walnuts. 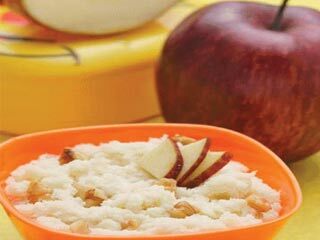 Your apple halwa is ready to serve!